Corona, January 22, 2019 – When Bob Dylan skipped his acoustic guitar and “went electric” on stage in 1965, it was with a Stratocaster model from Fender Musical Instruments Corp, considered by many the quintessential rock ‘n’ roll electric instrument. Now Fender is releasing a California-made acoustic guitar – its first production acoustic built in the United States in nearly 50 years. The company on Tuesday launched the American Acoustasonic Series Telecaster, which will sell for about $2,000 and be manufactured at the company’s Corona, California factory. Fender already sells acoustic guitars, but they are made overseas at lower prices and are aimed at beginners and intermediate players. It has not made acoustics in California since a limited run in the 1960s and early 1970s. Fender will be competing against California-based Taylor Guitars and Pennsylvania-based C.F. Martin & Co.
“There’s a substantial amount of volume done in that $1,200 to $2,500 price point, but it’s become almost a Martin and Taylor duopoly,” said Brian T. Majeski, editor of The Music Trades Magazine, which tracks the industry. Mooney said Fender hopes to establish “a new category” with an instrument that has features of both acoustics and electric. For example, the new Acoustasonic works with either kind of amplification systems and can be plugged directly into a laptop to make digital recordings. Those features are part of a push to reach younger working musicians that will see Fender spend about $50 million on marketing this year, much of it on social media. Privately-held Fender had $550 million in revenue in 2018, growing at a “double digit” percentage, Mooney said. 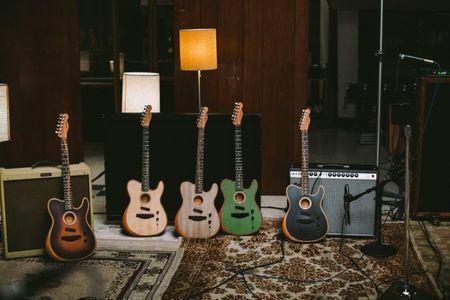 Mooney conceded the new instrument might meet skepticism from guitar purists at first, just like Fender’s guitars did in the early 1950s, when its original electric Telecaster was a solid slab of wood when most guitars were still hollow.